From all parts of the world come myths and legends about the underworld, a mysterious and shadowy place beyond ordinary human experience. The underworld is the realm of the dead, the destination of human souls in the afterlife. In some traditions, it is also the home of nonhuman, supernatural, or otherworldly beings such as fairies, demons, giants, and monsters. Although usually portrayed as a terrifying, dangerous, or unpredictable place, the underworld appears as a source of growth, life, and rebirth in some myths. Many descriptions of the underworld include elements of earthly life, such as powerful rulers and palaces. The most common idea of the underworld is that it lies beneath the everyday world. The passage from this world to the other may begin by descending into a cave, well, or pit. However, the distance between the two worlds is more than physical, and the spiritual journey involved often includes great peril. The souls of the dead are the principal travelers, but sometimes living heroes, mystics, and shamans also make the journey. The Land of the Dead. Many cultures believe that after death the soul travels to the underworld. In some traditions the passage to or through the underworld is part of a process that involves judgment of the individual's deeds when alive, and perhaps punishment for evil deeds. In others the underworld is simply the destination of all the dead, good and bad alike. Some of the earliest descriptions of the underworld occur in myths from ancient Mesopotamia*. One tells how the fertility goddess Inanna, later known as Ishtar, descends into the kingdom of the dead, ruled by her sister Ereshkigal. Trying to overthrow Ereshkigal, Inanna is killed. The other gods convince Ereshkigal to release Inanna, but Inanna cannot leave the underworld without finding someone to take her place. She determines that her husband, Dumuzi or Tammuz, should be her substitute. Some scholars believe that this myth is related to the annual death and rebirth of vegetation. The underworld Inanna visits is the same as that described in the Mesopotamian epic of Gilgamesh, in which the character Enkidu has a vision of himself among the dead. The underworld described is a dim, dry, dreary place called the House of Darkness, a house that none who enter leave. The dead dwell in darkness, eating dust and clay. Although recognizable as individuals, they are pale and powerless shadows of their former selves. This Semitic* image of the underworld appears in early Jewish mythology. The Jewish underworld was Sheol, which means "pit." The idea of the afterlife played a central role in Egyptian religion. When humans died, their souls began a difficult journey through the underworld. This tomb painting of the 1200s B.C. 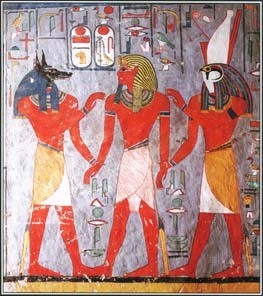 shows Ramses I surrounded by deities in the underworld. It held all the dead who had ever lived. Over time, as the idea of judgment in the afterlife took root in Jewish and then Christian belief, the early, neutral concept of the underworld changed. Sheol became a place of punishment and torment for the souls of sinners. The ancient Greek vision of the underworld was, at first, much like that of the early Semitic cultures. All the dead went to the same place—a vague, shadowy underworld populated by the ghosts, or shades, of the dead. This realm is sometimes called Hades, after the god who ruled it. Gradually the underworld of Greek and then Roman mythology became more elaborate. The kingdom of Hades was said to lie either beyond the ocean or deep within the earth, separated from the world of the living by five rivers: Acheron (woe), Styx (hate), Lethe (forgetfulness), Cocytus (wailing), and Phlegethon (fire). Cerberus, a fierce, three-headed, doglike monster, guarded the entrance to the underworld, which consisted of various regions. The souls of the good dwelled in the Elysian Fields or Islands of the Blessed, while those who deserved punishment went to a deep pit called Tartarus. To the Maya of Mesoamerica, the underworld was a dreadful place, but not one limited to sinners. Only people who died a violent death went to a heaven in the afterlife. Everyone else entered Xibalba, the underworld, whose name meant "place of fright." Any cave or body of still water was an entrance to Xibalba. The dead were not confined to the underworld forever. In the Mayan sacred book Popol Vuh, the Hero Twins Hunahpú and Xbalanqúe outwitted the lords of Xibalba and left the land of death. The souls of kings and nobles could also escape from Xibalba if they were summoned by living relatives during the Serpent Vision ceremony. The Aztecs of central Mexico believed that the underworld consisted of eight layers, each with its own dangers, such as drowning or sharp blades. Souls descended through the layers until they reached Mictlan, the bottommost part of the underworld. The underworld of Japanese mythology was Yomi, land of night or gloom. It was empty until the creator goddess Izanami died after giving birth to the god of fire. The maggots that appeared in her dead body grew into a host of demons who populated Yomi and tormented the souls of the wicked. Although Yomi was said to be a dark region of barren plains and lonely tunnels, artists often portrayed it as an underground palace crowded with the dead and demons. Also there was Emma-ô (the Japanese version of Yama, the Buddhist god of death), who judged the souls as they arrived inYomi. The Journey to the Underworld. Many myths tell of heroes who entered the underworld while still alive. Those who survived the ordeals of the journey often returned to the living world transformed by the experience, perhaps bearing special wisdom or treasure. Some heroes wished to rescue or reclaim a loved one who had died. In Greek mythology, Demeter went down to the underworld to try to bring back her daughter, Persephone, whom Hades had carried off. The Greek hero Orpheus* traveled to the underworld in search of his wife Eurydice. Chinese Buddhist mythology tells of a hero named Radish, a disciple of Buddha. Before leaving on a journey Radish gave his mother, Lady Leek Stem, money for begging monks. The mother failed to give the money to the monks, but she lied to her son and said that she had done so. When Lady Leek Stem died, she went to hell. Radish became so holy that he was made a saint named Mulian. With Mulian's enlightenment came the knowledge of his mother's torment. He went to hell to save her, although Yama, the king of hell, warned him that no one had the power to change a sinner's punishment. On his way Mulian had to travel past 50 demons, each with the head of an animal and swords for teeth. By waving a wand that Buddha had given him, he was able to make them disappear. Finally Mulian found his mother, nailed to a bed. But he could not release her; only Buddha could change a sinner's fate. Mulian asked Buddha for mercy for his mother, and after the proper prayers Buddha released Lady Leek Stem from hell. 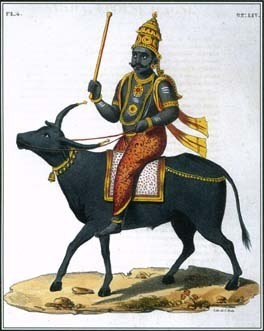 The Ashanti people of Africa have a myth about Kwasi Benefo, who made a journey to the underworld. Kwasi Benefo married four women in turn, and each one died. Miserable and alone, he decided to go to Asamando, the land of the dead, to seek his lost loves. He went to the place of burial and then beyond it, passing through a dark, silent, trackless forest. He came to a river. On the far side sat Amokye, the old woman who greets dead women's souls. She felt sorry for Kwasi Benefo and allowed him to cross the river, though normally the living are forbidden to enter Asamando. Soon Kwasi Benefo found the invisible spirits of his wives. They told him to marry again, promising that his fifth wife would live and that they would be waiting for him in the underworld when his time came to die. Kwasi Benefo fell asleep and awoke in the forest. He brought from the underworld the precious gift of peace of mind, which allowed him to marry and live a normal life for the rest of his days. The underworld is sometimes a mirror image of the world above. According to some African myths, the underworld is just like the ordinary world except that it is upside down. Its people sleep during the day and are active during the night. In the Congo, tradition says that the world of the living is a mountain and the underworld of the dead is another mountain pointing downward. Chinese myths tell of "China plowed under," an underworld inside the earth that mirrors every province and town in the world above. location was said to be far away on remote islands or lying beneath the sea or the ground. Certain caves or hills were believed to be entrances to this otherworld. In Wales the otherworld was called Annwn, which means "not-world." It had a number of different sides. Primarily, the otherworld was the kingdom of the dead, and its grim ruler was known as Arawn to the Welsh and Donn to the Irish. However, the otherworld could also be a joyous and peaceful place or a source of wisdom, magic, and enchantment. The fairies, demons, spirits, and other supernatural beings who lived there were neither purely good nor purely evil. Depending on the circumstances, they could bring humans either harm or good fortune. Celtic folklore is filled with legends of living people who entered the otherworld. Some went voluntarily, like King Arthur of Britain, who led an army into Annwn to capture a magical cauldron. Others were lured into the otherworld by fairies, sometimes in human or animal form. The theme of a human straying into the otherworld appears in many European fairy tales that draw on the old notion of the underworld as a supernatural realm. In such stories, a human who ate or drank while in the otherworld could never leave. Those who resisted food and managed to leave found that time had different meanings in the two worlds. After spending a single night in the otherworld, a person might return to the world above to find that years had passed. The Source of Life. The underworld does not always represent the kingdom of the gloomy dead or the home of dangerous beings. In some myths it serves as the point of contact between the surface world of the living and the earth's powerful creative forces. Among the Ibo people of Western Africa, Ala, the goddess of the underworld, is also the earth goddess who protects the harvest, which emerges from the ground. Ala receives the dead—burial is thought to be placing the dead in her pocket or womb. However, Ala also ensures life by making people and animals fertile. Yama, the Buddhist god of death, judged souls as they arrived in the Japanese underworld called Yomi, a dark land of gloom. father the sun god to guide unformed creatures up to the daylight. Once above the ground, the creatures changed into human beings. According to the Jicarilla Apache of New Mexico, in the beginning all people, animals, and plants lived in the dark underworld. Those who wanted light played a game with those who liked darkness. The light-lovers won, and the sun and stars appeared. Then the sun, looking through a hole in the roof of the underworld, saw the surface of the earth, which was covered with water. Eager to reach this hole in the underworld, the people built four great hills that grew upward. But after girls picked the flowers from the hills, the hills stopped rising. Then the people climbed to the roof on ladders made of buffalo horns. They sent the moon and sun through the hole to light the world and dispatched the winds to blow away the water. Next they sent out animals. Last of all, the people climbed up into the new world. Once they reached the surface, they spread out in four directions. Only the Jicarilla stayed in the original homeland near the hole that led up from the underworld. See also Afterlife ; Elysium ; Hades ; Hell ; Inanna ; Izanagi and Izanami ; Orpheus ; Persephone ; Sheol ; Styx ; Xibalba .